At the same time, we’ve found some of the dialogue regarding Occupy Philly’s relationship to Mayor Nutter and the police deeply disturbing and detrimental to fighting this system controlled by profit, greed and exploitation. Nutter has come out embracing the occupation that is on the doorsteps of his offices, claiming he too is part of the 99%. During the first night of the occupation, Nutter even received warm embraces by Occupy Philly campers. 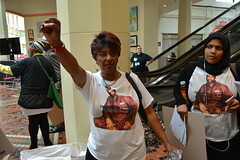 At the General Assembly, numerous voices stressed that Nutter and the police have come out as our allies. While the mayor has some clear political aspirations and obligations in regards to our occupation, we feel he’s already exposed himself over and over as an enemy of struggling communities in Philadelphia and has always worked in favor of the 1%. The mayor has chosen a strategy of appearing to embrace the protests in an effort to ensure that he and his bad policies do not become a target. Both Mayor Nutter and police chief Ramsey have made careers for themselves by catering to and doing the work of the rich and powerful in ways that have pitted organizers for social justice against him time and time again. Both Ramsey and Nutter have consistently made decisions with brutal (even deadly) impacts on the lives of struggling Philadelphians while giving elites and powerful corporations massive tax breaks, protection and preferential treatment. Community organizers and workers in Philadelphia have been fighting for the past year for a bill that would allow workers in businesses with eleven or more employees to earn up to seven paid sick days a year. 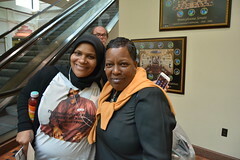 In a major victory for workers and families, advocated convinced City Council to pass the bill. 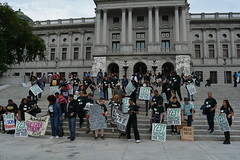 Mayor Nutter, however, ignoring the views of 71% of Philadelphians, bowed to business lobbyists and vetoed the bill. 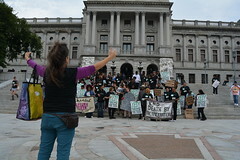 Nutter’s veto leaves over 200,000 wage-workers in the city in the precarious situation of having to choose between their job and the health of their families and themselves. Mayor Nutter has certainly demonstrated his willingness to sacrifice the rights and health of hard working Philadelphians in order to secure the interests of the business elite. At the start of the economic crisis the urgency to act became pressing to government officials. Balancing the budget on the backs of poor and working people became the favorite strategy of many of them, included our Mayor in Philadelphia. On November 6, 2008, Mayor Nutter put forth his plan to make drastic cuts to public services in the city. Nutter’s plan included the closure of 11 public libraries and 68 public pools. Also on the chopping block were fire stations, drug and violence prevention programs, and hundreds of city jobs. In 2010, Mayor Nutter passed a budget that ordered rolling brownouts for neighborhood fire stations. This means that on certain days, neighborhood fire stations are not open. The mayor claimed that this decision was necessary to close a budget gap, but left corporate tax loopholes and funding for police intact. Already at least 3 children have died because of these brownouts, and scores of others have been injured. Clearly the mayor cares more about maintaining a cozy relationship with big business than protecting the lives of families in Philadelphia. Mayor Nutter has illegally refused to engage in bargaining with public sector workers. Nutter has forced city workers to operate without a contract for the past two years, and has repeatedly attempted to eradicate or privatize family-sustaining public sector jobs. 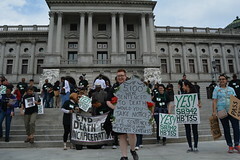 People with AIDS have died in Philly because they sleep on the street or are crammed into homeless shelters. 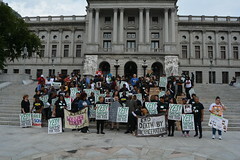 Though city currently has a waiting list for housing people living with AIDS- it is two years long and despite meetings, marches and actions by ACT UP targeting the mayor, he has refused to move money in the budget to put people in housing that he knows could save their lives. Nutter knows well that people with AIDS have died waiting for housing on the streets and in the shelters of Philadelphia. In Philadelphia there is a 10 year tax abatement on all new or substantially renovated properties. This means that the huge corporations building new condo developments and the wealthy people who buy those condos don’t have to pay any property taxes for the first ten years that they live there. New development drives up property taxes for existing residents, often displacing them from their own neighborhoods while wealthy gentrifiers pay nothing. In 2009, discovery in an immigration lawsuit leaked that the Philadelphia Police Department had been secretly been sharing their databases with that of Homeland Security’s Immigration and Customs Enforcement (ICE). Philly had previously been a city where police were barred from communicating arrest information to immigration officials, somewhat protecting the many immigrants who live here from deportation. 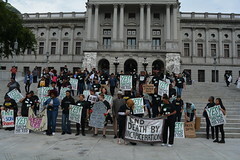 Upon their arrival Nutter and Ramsey cooperated to quietly integrate the databases resulting in ICE raids and deportations attacking and tearing apart families and lives of some of Philadelphia’s most vulnerable residents. Police in Philly have killed scores of mostly young blacks with impunity under Ramsey’s watch. While Ramsey has made public shows of attempting to discipline out of control cops, he’s overwhelmingly defended killer cops on his force. Those killed by police with few exceptions are young black men who already live in economically devastated neighborhoods. In response to the recent “flash mobs,” Nutter imposed a youth curfew in wealthy mostly white areas of Philly, clearly targeting the black youth. Dozens are facing charges already under Nutter’s response. 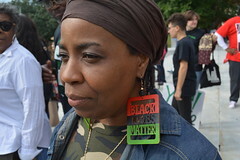 Instead of pursuing innovative ways to funnel resources, housing and opportunities to where it’s needed most, Nutter chose to increase repression of a black population already severely under the gun of state repression, police violence and incarceration. We know that city governments are strapped for cash and that elected officials have to make tough choices. And we also know that in our experience every time Nutter has been faced with those choices, he has made the wrong one. 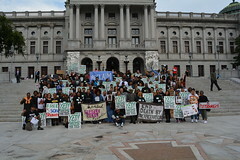 Because the mayor has reached out to Occupy Philly, we now have the opportunity to make concrete demands of him. We should use this opportunity (and create more!) to push for the changes that 99% of struggling Philadelphians need. This is not a new struggle. There are existing organizations and communities in this city that have already been working, organizing and calling for these changes for decades. You can download this as a pamphlet here!